What makes the Grand Canyon beautiful is what can also make it deadly with no resources for help beyond the rim and trails that host humans, mules, and intense heat. There’s a sign at the top of Bright Angel Trail with a provocative question: Could you run the Boston Marathon? A view of the 12.5-mile Bright Angel Trail from the Plateau Point. Photo by Grand Canyon NPS. In fact she had completed the 26.2-mile grueling marathon in a little over 3 hours just a couple of months before she and her running partner decided to take a day run/hike in the Grand Canyon in early July 2004. The National Park Service sign tells how Ms. Bradley, a 24-year-old University of Chicago medical student, and her friend started their hike at Grandview Point on the South Rim but failed to take a map; they thought they were on a 15-mile trail when it actually stretched 27 miles. They also failed to take enough provisions. They each carried 1 1/2 liters of water, two energy bars and one apple. Temperatures soared to 105 degrees. By midafternoon, they were out of water. When her friend couldn’t go on, she left him to get help. The man waited in the shade and managed to find his way out the next day. Ms. Bradley’s body was found in the canyon two days later. The sign is a stark warning for hikers attempting to descend into the Grand Canyon without proper preparation. Roughly 250 people are rescued each year from the canyon, another 10 or so die because of falls, dehydration or suicide. “The difference between a great adventure in the Grand Canyon and a trip to the hospital (or worse) is up to YOU. DO NOT attempt to hike from the rim to the river and back in one day, especially during the months of May to September,” according to Park Service warnings. Permits are not required for noncommercial day hikes. 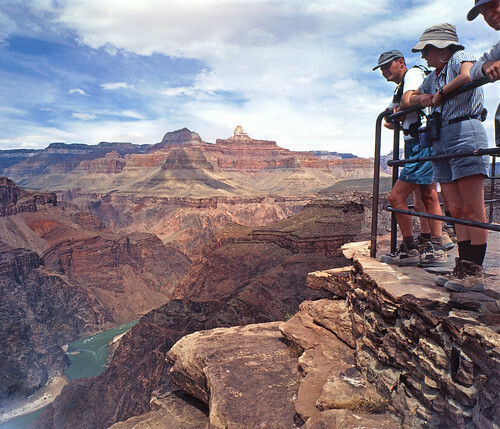 Hikers should be aware that they’ll be sharing Bright Angel Trail with mule trains. Several recent encounters between hikers and mules have resulted in injuries to packers and the death of some mules. To ensure safety, there’s a protocol to follow. Step off the trail on the uphill side away from the edge. Follow the direction of the wrangler. Remain completely quiet and stand perfectly still. Do not return to the trail until the last mule is 50 feet past your position. Bright Angel Trail, at elevation 6,850 feet, is at Grand Canyon Village, just west of Bright Angel Lodge on the South Rim. (c)2012 the Pittsburgh Post-Gazette. Distributed by MCT Information Services.